CLAYTON, NC (June 8th, 2016) – The Clayton Rugby Football Club is proud to announce that they are hosting a player development camp for all men’s and women’s players in the Carolinas Geographic Rugby Union. The camp is a joint venture between Clayton Rugby, the Carolinas Geographic Union, and the Glendale Raptors. The camp is part of an initiative to provide higher level development, coaching, and playing opportunities to members of the CGU. The camp is scheduled for August 19th and August 20th in Clayton. 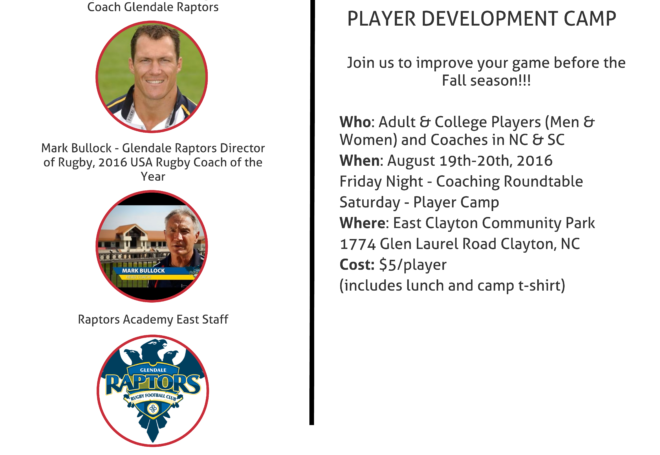 Staff from the Glendale Raptors, back to back Pacific Rugby Premiership Champs, will be on hand for the camp. Raptors’ Head Coach Andre Snyman brings a wealth of playing and coaching experience to the camp. Snyman played in 38 test matches for South Africa from 1996-2006 and has been with the Raptors since 2011. Director of Rugby for the City of Glendale, Mark Bullock will also be in attendance. Bullock was named USA Rugby Coach of the Year in 2016 and has experience coaching high performance programs for both men and women. Bullock has also served as the USA U19 Head Coach. Raptor Academy Coaches, based in Clayton, round out the instructor lineup. The weekend of rugby kicks off Friday night, August 19th, with a Coach and Club Administrator round table discussion led by Bullock and Snyman. The session also serves as a networking and social session for coaches and administrators in an effort to build collaboration between clubs in the CGU. Saturday brings a full day player development camp for men and women. With financial assistance, from the CGU and the Clayton RFC, players are able to get instruction from some of the top coaches in the USA at nearly no cost. Players get a full day of rugby with core skill sessions, position specific skills, and finish the day with scrimmages. Lunch will be provided to players. Coaches are encouraged to shadow the camp coaches, take notes, ask questions, and get involved. To register for the 2016 Player Development Camp, please follow this link. The cost for players is $5 and includes lunch on Saturday and a camp t-shirt. The fee can be paid at the camp, but players are required to register prior to the camp, so that t-shirts can be ordered and camp staff can prepare. There is no cost for coaches and club administrators. The registration deadline is August 1st.